Pictures , Always interested when someone engineers something new ! I love my Aimpoints but not a fan of frame mounts, too snappy for me. Plunker wrote: Pictures , Always interested when someone engineers something new ! Sorry, file didn't attach the first time .. I made a few different scope mounts. Finally said heck with it and just cut the slide. Thanks for the pictures and details guys. Check out the Aimpoint H1 mount by Double Alpha. 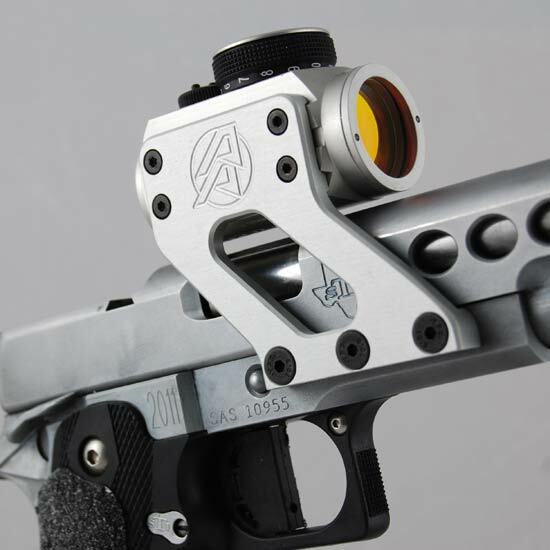 dronning wrote: Check out the Aimpoint H1 mount by Double Alpha. I'm aware if that mount, but I wanted a dot forward, and I have a rail on my dustcover. And I think that one has too thin of walls, but that's just my opinion.